Impress friends, delight the little ones, then pat yourself on the back for a job well done. That’s three great rewards for the price of a cardboard box. 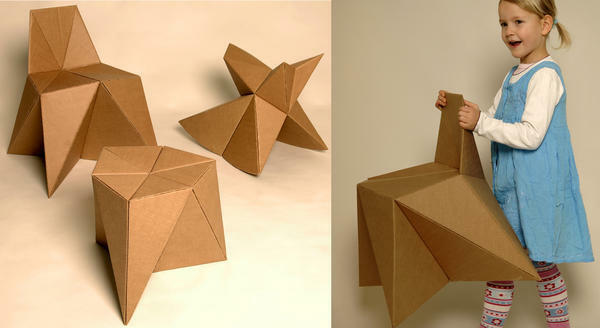 Foldschool has a range of free do-it-yourself cardboard furniture for children aged eighteen months to four years old. Three patterns are available for download including a stool, chair, and rocker. Looking more like miniature design pieces than amateur craft projects, the end results are bound to give you boasting rights. You don’t need to be Martha Stewart to gain crafting success. Foldschool gives clear instruction along with a sample piece to practice on. Simple tools are required for the making process, they can be found at most art supply stores. The trickiest item to source is 4mm cardboard, try packaging suppliers like The Boxman. Ask for cardboard sheets or boxes big enough to cut up. Cut, fold and shape your masterpiece then let the kids run wild. They can paint (remember your drop sheet), draw, sit and stomp on their new chairs. 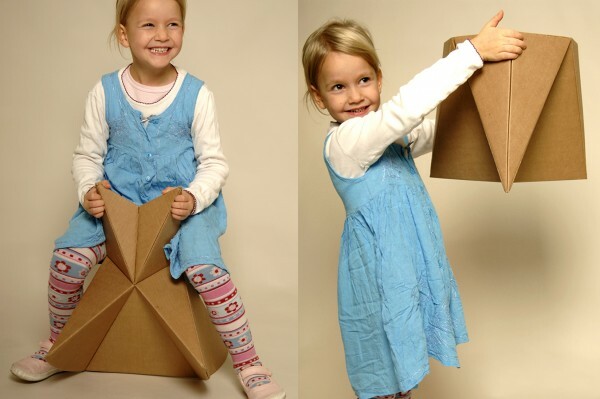 Foldschool creators claim that the folding of cardboard makes the furniture very solid and should even bear the weight of some adults. Swiss-based architect Nicola Enrico Stäubli created Foldschool to provide people with affordable and sustainable design through smart manufacturing. His concept cuts out the middle man and provides you the opportunity to get creative. Thanks to the internet his designs have been downloaded across the globe. Download your clever cardboard furniture at Foldschool. For more clever cardboard ideas take a look at our Ma Cacabane post.